Discussion in 'Patriots Draft Talk' started by borg, Nov 13, 2018. 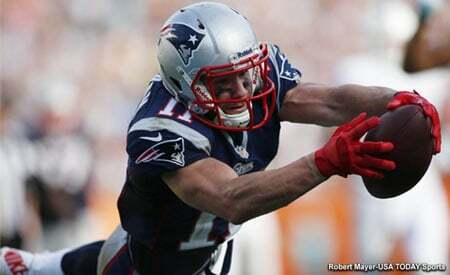 Very curious if PatsFans pay attention to BC football and if so, what are your impressions of A.J. Dillon and his potential as a NFL RB. I've watched a ton of BC football this year and I've listened to the announcers wax poetically about this guy. I've seen Dillon dominate verses the weak sisters on BC's schedule and look less than ordinary verses the big boys. I see a RB that is slow to get up to speed but when he hits full stride he can turn the corner and go up field. Dillon is a horse, and the featured component of an offense intent on grinding it down the field with the ball in Dillon's hand. Note: BC's Qb is underwhelming and incapable of carrying the Eagles vs the ACC's top tier and defenses are definitely stacked up to face Dillon. For such a big powerful looking guy, he shies away from contact on most every carry. I have yet to see him lower the pads and punish defenders. More often then not, when he has time to prepare for the oncoming hit, he turns his back into the tackler purposely. He actually is facing backwards when hits arrive. I've never seen anything like it. Setting that issue aside, his biggest limitation IMO has to do with his lack of acceleration out of the gate. As I mentioned before, once he gets up to speed he's a freight train with a bit of wiggle. But defenses have had success dropping him in the backfield. In a couple of ACC games when Dillon left the field due to injury, his replacement, who had burst, had much more success verses the same run defense. For comparison sake.....Think Ron Dayne. Thoughts on Dillon at the next level? I try to watch everyone I can but focusing on Allen, Denis, Cheevers, Lindstrom, Ray but obviously Dillion has impressed at times. Dayne isn't the worst comp. Jamal Lewis comes to mind. I'm not a RB/WR early guy to begin w & he wouldn't change that for me. Honestly dug into him in terms of film bc I mainly focus on who's eligible but seems like a workhorse type that needs the workhorse volume to succeed rn. seems like a workhorse type that needs the workhorse volume to succeed rn. In today's high scoring NFL, I honestly don't see an OC having the patience + job security to give a RB high volume/low output carries with the hope the RB might eventually break one. A punishing runner might be able to soften/tire a defense eventually though much of that softening is done by the OL. Regardless......Dillon's noticeable aversion to contact on the college level raises a red flag, at least to me. Announcers describe him as elite, I wonder if he will be drafted on day 3. He's built like a battering ram....he just doesn't batter. DE Zach Allen is somewhat of the opposite to Dillon. Allen doesn't physically resemble a cut/physically imposing NFL star....but his play sure does. He looks like a baby face, plays like a monster.....and his game vs Clemson was a big money maker for Allen. He was impressive on the big stage. How early will his name get called? Exactly. It can work if you're elite but look at the Jags w LF7. Elite big runner but again nowadays you just don't need that type, especially w the spacing you can create on offense. I liked the way you described Allen & I've described him closely to that as well. Allen still hasn't grown into his body. Guy could be a monster w a few years of NFL training. I'd love to see him here. Just love his game. So pure. All heart & motor. Such a worker, all I hear are good things off the field. Lindstrom is a savage as well. He'd be an excellent fit in Seattle. AJ Dillon = Andre Williams? Aj Dillon > André Williams. My only knock is in two years his shoulders will be shot. Not a lot of tread left on the tires. Why? He’s a good coach. The only reason you guys are where you are is because he’s able to recruit in the south (and particularly Florida) instead of having to rely on slow, white nerds in Massachusetts. I wouldn’t be so quick to write him off if I were you. His lousy QB isn't from Florida; he's from the swamps of Joisey. And that million-dollar-costing collapse is on the pair of them. I'll take slow white nerds from MA any day of the week ahead of his lousy QB. And that QB is why you lost. Nevertheless you have a coach with his flag planted in the southeast. You keep that guy and hope he gets it right at QB. You’re not competing with a team with the speed of FSU without Addazio and his ability to recruit down here. Unless you can get a guy like Franklin or Meyer (which BC won’t because those types of coaches aren’t exactly knocking down the door to coach there), you keep Addazio. But I’m not sure why I’m trying to talk you out of this. The Gators would directly benefit from another coach that can’t recruit in the southeast. So yeah... fire away. He recruits very well. His gameplanning and especially his playing not to lose all the time puts his ceiling at 7 wins. This past game vs FSU and last year not being able to score from 1st and goal on the 1 vs wake last year (or 2 now) are perfect examples of his shortcomings. Oh, I dont follow college closely enough to have any candidates. He's a decent coach that has some strengths and glaring and frustrating weaknesses. I think the new AD, an Ohio State guy, probably will be looking for someone to take them to the next level. He looks pretty good. A little flat footed, but that is understandable at 245 lbs. The point I want to make is: Teams pass it like 65% of the time nowadays, and they're in the shotgun about 65% of the time too. How does Dillon fit into that gameplan? Can he pass block? Can he catch passes? Even the best powerbacks have some trouble translating to the NFL these days. Okay but who is that coach going to be that also has his flag planted in the southeast with respect to recruiting? No offense, but BC isn’t a job that the Sabans and Meyers and Swinneys and Franklins of the world are dying to have. I didn't go there and I definitely understand your point about not attracting -and especially keeping- name coaches, so no offense taken at all. I just think Jarmond -the BC AD- has his eyes on something greater than 7 wins each year. We'll see soon I guess.